A collection of Photos and Posts featuring Matt Shearer’s Gigs. Mostly around London at Mean Fiddler venues,… and a few elsewhere. With the sun shining and some Jazz from Esquire Swing, we all met up at Belgique for Fathers Day. This was one of The Dees’ last gigs before activities petered-out in 2007 ish. 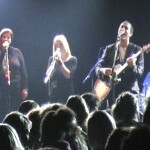 The Showcase for The Dees, The Album, in July 2004 at the Union Chapel in Islington, London. Right near Highbury Corner. Photographs by Conal Jones. Sound by Niall Acott. Lights and drama by Dan’s mates, inclluding Andy Audsley. Yesterday marked another great evening at The 100 Club with King Pleasure playing. Great memories of a raucous gig at The Garage. We had a full compliment of backing vocals, from the amazing Rachel & Sarah. Last night – another great gig from Ray Gellato at The 100 Club. A retrospective post – as I just found some photos from this seminal 1991 event in the Oundle School Great Hall. Will add some gig shots if and when I find them!